It's been too long since we've been to the beach. In fact, we haven't been since January. We were there for my birthday. 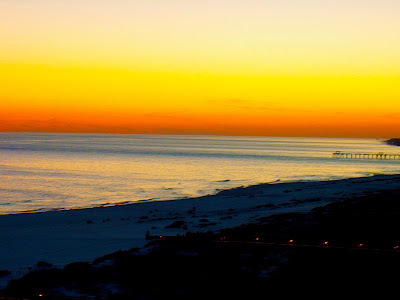 I get a little envious when I visit my blog-buddy Barb who lives at the beach in Florida. I love it there this time of year. 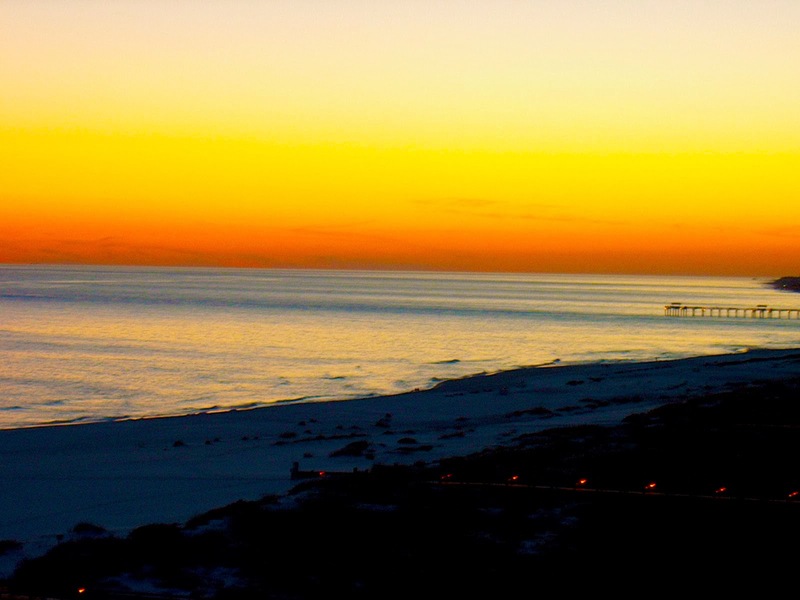 This picture was taken at Gulf Shores just as the sun dipped below the sea. It was cool there this past January. We spent a lot of time walking on the beach. By midday the sun was warm enough to wear shorts, the wind off the water and the ocean spray made us glad we'd worn warm sweaters. At night we had to bundle up. I think what I love most is that the crowds are almost non existent. We had the beach to ourselves, and there was no waiting at restaurants. I'm excited. This has been an interesting year. We suffered loss, but we've celebrated success too. Most years are like that. The trick is to keep a journal so that your remember the good stuff, because it helps to temper the bad. What a striking photo! I love empty beaches. I hope the new year brings you lots and lots of good! Great photo. I love a deserted beach, makes me feel like I own the world. Great picture Rick. Thanks for the mention too. You wouldn't be envious for these past 2 weeks though. We've had sun with horrible winds and surf or rain and cool, so no beach time. I hope it passes soon. This is the perfect time of year as you said. NO CROWDS!! My wish is that you and Jilda get to Florida someday and we can meet and hang out!! I love beaches too when not crowded. Journaling is a great memory booster. You can close your eyes and imagine being there again. I like to write most of the time. I do get carried away in happy times therefore I forget to write. I think you're right about the good stuff helping you keep the bad stuff in perspective...too often, we forget that there are always some of both in anyone's life. This year had a big loss for me as well, my closest friend, but lately I've been focusing on all the goods we had in the past. Beautiful beach sunset. Happy new year!! At first I thought I was going to have a love/hate relationship with you and Jilda...you know, love you guys, hate you're on a warm, sunny beach and I'm shoveling snow! I guess I can wait until you actually are there! Ha! Plus the weather is beautiful here today...sunny, in the high 40's. Not shorts weather, but I'll take it! I hope the beach trip happens soon! We haven't been to the beach since the year before my grandma got sick - my cousin decided to get married down there, so we all traveled en masse to Florida. The beach holds good memories.